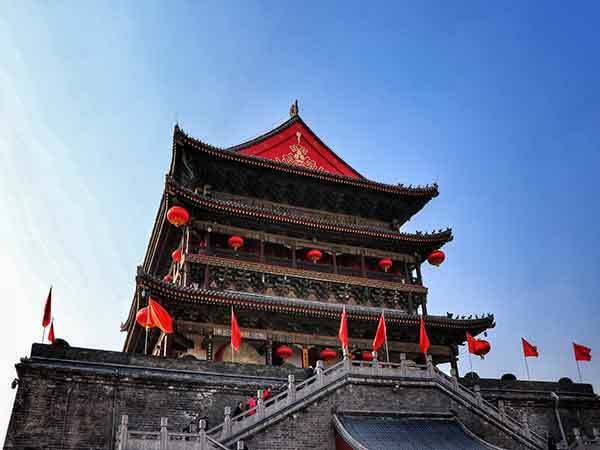 Today, we have a tour in Xi’an downtown to feel this ancient city from its old buildings and ancient stele culture. This day tour is scheduled as: in the morning, have a three hours tour in the Stele Forest, in the after, visit Bell Tower and Drum Tower, in the nightfall, walk to Muslim street and enjoy local food and experience local night life. And this tour is a leisure one, you don't have to follow a tight schedule, and have enough tour time in each attractions. You may adjust it according to your own needs. The Stele Forest, also known as Beilin Museum, is an art museum, famous for its collections of steles, and stone carvings. The Stele Forest, is located in Xi’an downtown, close to Xi’an City Wall, and first built in 1944. It covers an area of 34,667 square meters, consists of Confucian Temple, stele forest gallery and stone carving art gallery, and has 12 exhibition halls, with an exhibition area of 4,900 square meters, and houses more than 11,000 items of cultural relics. The Stele Forest collects lots of steles and stone carvings with much cultural value. Some of stone inscriptions are made by great calligraphers in ancient China, and some stone paintings are carved with beautiful vivid images and figures. The stone carving art gallery exhibits about 150 items of stone carvings which represent the highest achievement of stone carving in Buddhism art. The stele forest gallery displays over 4,000 items of steles and epitaphs and some of them have a history over 2000 years. From No.1 exhibition hall to No.7 exhibition hall, items are exhibited according to time period and dynasty. I advice you pay for a tour guide service, otherwise you won’t know much about Chinese steles and stone carvings. Tour guide service hour is about one hour. Public bus: you can take a public bus, like No. 14, No. 23, No. 40, No. 118, No. 214, No. 221, No. 223, No. 232, No. 706, No.402, No.512, No. 619, No. 704, No.800, etc. By taxi: it is located in the city center, which is convenient for you to take a taxi, and it won’t cost much. From Xi’an Railway Station to the Stele Forest: the Stele Forest is only 6.7 kilometers away from Xi’an Railway Station. You could take No. 258 public bus at the railway station bus stop, get off at Wenchang men bus stop, then walk about 400 meters. Or you may take a taxi. In this museum, first you go to the stele forest gallery, see tremendous steles in every dynasties with a time span of over 2,000 years, then go to the 12 exhibition halls of stone inscriptions, and enjoy the amazing calligraphic works written by great calligraphers. 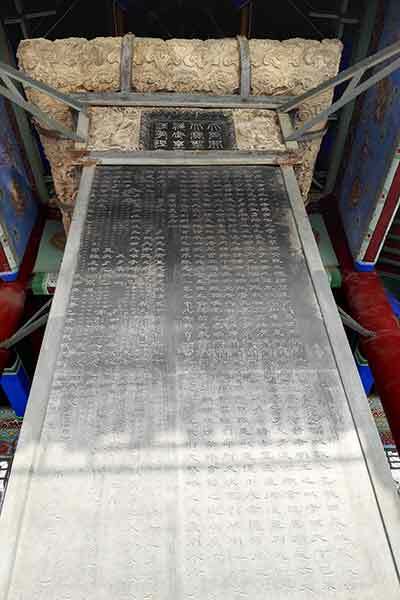 From these steles, you may know the evolution and development of Chinese writing and calligraphy, and also the content of the inscription carved on epitaphs. 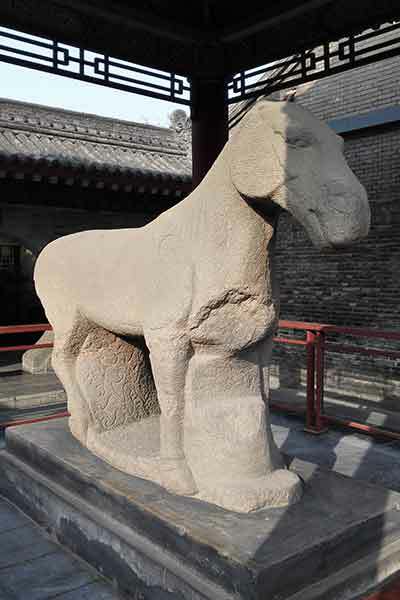 Second, go to the stone carving art gallery, and you can see beautiful stone paintings, and lifelike stone carvings, like horse stone carving and Buddha stone carving, and have a deep understanding of Chinese stone carving art, and Buddha culture. Third, you can go to the Confucian Temple, see its ancient buildings and layout, and experience the Confucian culture. In the Confucian Temple, Jingyun bell is hanging in a pavilion, made in the Tang Dynasty(618 AD-907 AD), and the bell body is carved with inscription written by Li Dan, the Emperor(662 AD-716 AD). Still you can see a stone painting of Confucius. After a tour in the Stele Forest, you may have a lunch and have a good rest. In the afternoon, you will go to Bell Tower and Drum Tower. Bell Tower in Xi’an is located in the crossing of four main streets inside the Xi’an City Wall, and it is the biggest and best preserved bell towers existing. It is first built at 1384, but in 1582 it was moved to the right-now site. Bell Tower occupies an area of 1,370 square meters, with a total height of 36 meters. It is composed of a quadrate base, a wooden tower, and a golden top. The brick base has four arches, with a height of 8.6 meters, and the tower is a brick and wooden structure building with three layers of eaves which are covered with dark green glazed tiles, and the golden top is originally covered by copper, which was changed to gold in the middle of 20th century. In the past, the large bell was hanged in the tower, Jingyun Bell, used to give time and give warns of big events, but it is exhibited now in the Stele Forest. For more information, please click the Bell Tower. Public bus: take a public bus, like No. 7, No. 8, No. 601, No. 611, No. 618, etc., and get off at Zhonglou (Bell Tower) bus stop. Subway: take subway line 2, and get off Zhonglou (Bell Tower) station. 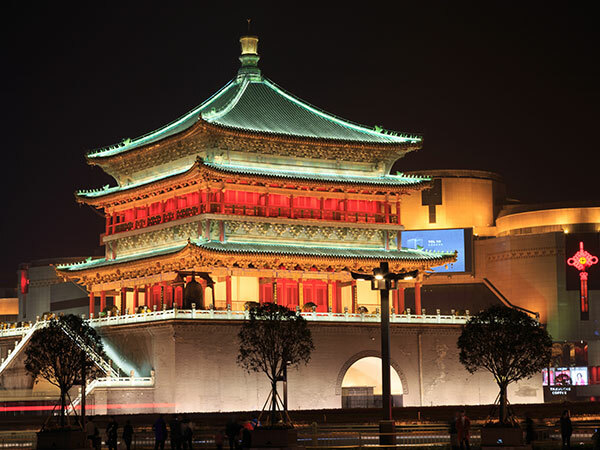 From the Stele Forest to Bell Tower: Bell Tower is in the center of Xi’an city center, and the center of Xi’an City Wall, close to the Stele Forest and Drum Tower. From the Stele Forest to Bell Tower, you may walk or take a public bus. Walking may take about 20 minutes. If you take a public bus, first go to Wenchang men bus stop, take No. 208 or No. 221 public bus and then get off at Zhonglou (Bell Tower) bus stop. Xi'an Bell Tower Chime performance: every day, there are six chime performances, starting at 09:30, 10:30, 11:30, 14:30, 15:30, 16:30. Tour guide: 30 yuan for a group of less than 10 persons, and 50 yuan for a group of 10-20 persons. Free tour guide service(Chinese): 09:30, 11:00, 14:00, 16:00. First, go into the Bell Tower, and feel its history through the buildings. 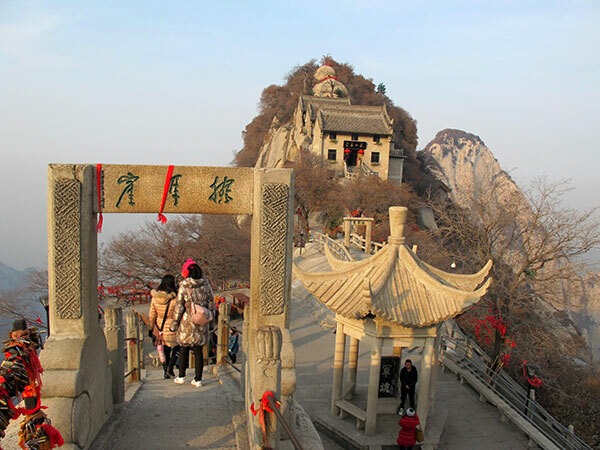 Then climb to the highest place to overlook this ancient city, and enjoy its beauty. Second, you can see some calligraphic works and paintings, and furniture in Ming Dynasty and Qing Dynasty. Still, you can see chime performance. Drum Tower is also in the city center, about 200 meters away from Bell Tower. It is the biggest drum towers existing, built in 1380 with an area of 1,377 meters, and a height of 36 meters. It is a brick and wooden structure building, and has a brick base and wooden tower body. The brick base is 8 meters high, 38 meter wide, and 52.6 meters long. In the past, there was a big drum, used to give time. For more information, please click the Drum Tower. Ticket: 35 yuan / 50 yuan for a joint ticket with Bell Tower. Drum Tower performance: every day, there are eight drum performances, starting at 09:30, 10:15, 11:00, 11:45, 14:00, 14:40, 15:30, 16:20. Free tour guide service(Chinese): 09:30, 10:30, 14:00, 15:30. First, go into the Drum Tower, and see its old buildings, and overlook this ancient city from the highest place. Second, you see a big drum and 24 smaller drums exhibited in the second floor, and also watch the drum performance which lasts for 10 minutes. Third, you go to the third floor which is a furniture gallery, and in here you can see furniture in Ming Dynasty and Qing Dynasty. 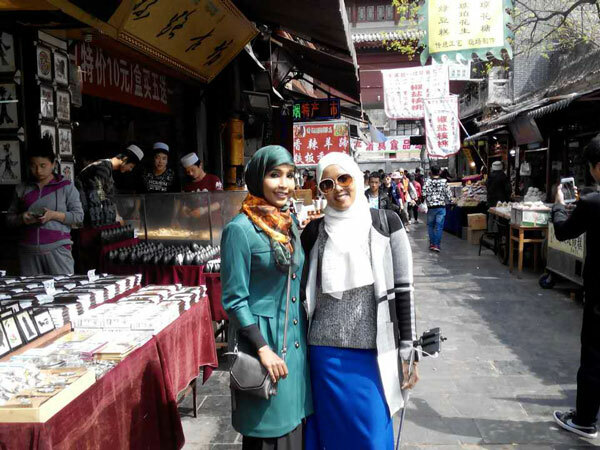 After a tour in Bell Tower and Drum Tower, you walk within ten minutes and have a cruise tour in the Muslim Street, which is a food street and has local gourmet food, snacks, special local products, and handcrafts on sale. For more information, please visit Muslim Street.